Green roofs aren’t particularly a new innovation; however, a resurgence in sustainable-focused living has helped increase the popularity of these “living roofs” in major cities across the US. Green roofs are roofs partially or completely covered with vegetation such as native grasses and flowering plants like lavender. Customers are finding the modern green roof beneficial, both environmentally and financially, and as the demand for green roofs increases companies like Greensulate are coming to the forefront in green roof production. What started out as a 10-person company has seen a 400 percent growth in business in 2010 in the wake of the green roof trend. As a result, Greensulate has been named by Businessweek “one of America’s Most Promising Startups.” Greensulate specializes in constructing green roofs. Very simply put a green roof is a living extension of an existing or newly constructed roof. It incorporates a water proofing membrane and root barrier, a green roof system, a drainage system, and a lightweight growing medium and plants. Each green roof Greensulate makes is unique, reflecting its owner’s needs, the particulars of the roof, and the geographic location of the building. There are three types of green roofs: extensive, intensive and hybrid. Extensive has a growing medium less than 6 inches while intensive has a growing medium greater than 6 inches. Hybrid green roofs, on the other hand, contain elements of both. The choice between extensive or intensive depends on access, budget, maintenance, visibility, and load bearing capacity. 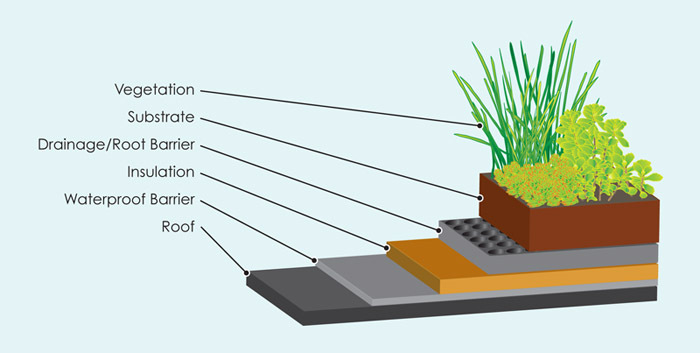 However, most green roofs are commonly composed of a waterproof barrier, insulation, drainage/root barrier, substrate and vegetation as seen in the diagram below. Green roofs serve several purposes for a building. Green roofs are amazing in their ability to clean and cool the air, beautify urban space and keep storm water out of sewers and waterways. This living architecture cleans the surrounding air, consuming carbon dioxide and emitting oxygen in the process. Green roofs reduce the volume of storm water runoff by absorbing and retaining water that would otherwise flood the storm sewer system resulting in sewage spills and overflows. This ability to absorb and retain water also helps filter heavy metals out of rainwater. Green roofs have also been known to provide insulation for the building, create a habitat for wildlife, and help lower urban air temperatures. It is apparent that the environmental benefits of a green roof are numerous. While a green roof greatly improves the aesthetics of the immediate area, green roofs can also reward a building owner with long term financial benefits. 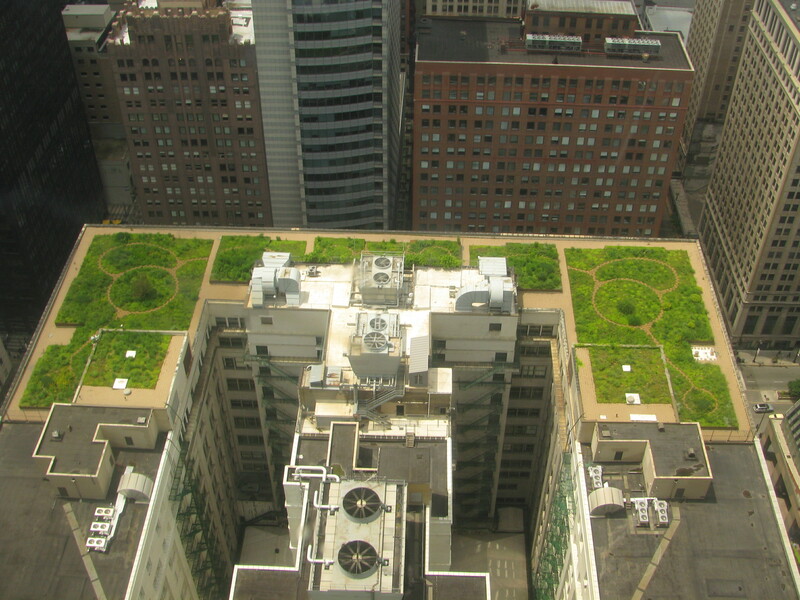 Based on Gallup polls and current real estate statistics, green roofs add proven value to the building. They can also reduce energy costs and extended the life of the roof by more than 50%. A green roof is often the key component of an autonomous building. However, as beneficial as the green roof is to both the environment and the building owner’s wallet, it is not without disadvantages. The main disadvantage of a green roof is the higher initial cost of the building structure, waterproofing systems and root barriers. The additional mass of the soil substrate and retained water can require additional structural support. Depending on what kind of green roof it is, the maintenance costs could be higher, but some types of green roofs have little or no ongoing costs. 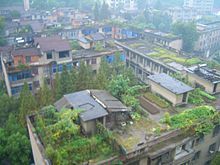 Some kinds of green roofs also place higher demands on the waterproofing system of the structure both because water is retained on the roof and due to the possibility of roots penetrating the waterproof membrane. While it may seem undesirable to pay such a large upfront cost for a green roof, the long term benefits outweigh the initial cost. Over time a green roof both saves the building owner money and helps the environment. When it comes down to finding new ways to incorporate sustainable design into every day life consider the green roof. This entry was posted in Required Topics by onm5006. Bookmark the permalink. Highly interested, I want to start a roof business in Saudi Arabia. I need all the help I can get. I want to start by building a small on my Villa roof, I have 9×9 M2 area. can I order some materials? I want the derange matts. Thanks for that, I have to do a sheet on green roof designs, but I don’t know where to start. If you could give me a site that would help answer one or more of the following questions, that would be greatly appreciated! 1. What is the definition to a sustainable, green roof design? 2. What are the components (layers) to a sustainable, green roof? 3. What are the benefits to a sustainable, green roof design? 4. What are the disadvantages of a sustainable, green roof design? 5. Are there specific requirements that need to be met regarding the pitch and slope of a roof prior to a green roof installation? 6. What types of materials are used in a green roof design? Very interesting. Indeed sustainability can be achieved by incorporating natural elements themselves into architectural design. Two examples could be the Quai Branly Museum in Paris (http://goo.gl/maps/8vkzX) and much of the portfolio of designer Fernando Laposse (http://www.fernandolaposse.com/projects/lufa-series/). There are many benefits to their implementation, yet the hurdles that they pose for their execution are probably what keeps them from being prevalent.